There are two ways to make a DVD, irrespective of a particular style. The first way is to follow your style’s structure: warm ups, basics, form and sampled applications. The second way, less common, is to offer, derived from your style, skills that might be universally helpful to appropriate seekers. Imagine a Long Fist practice that aids Shaolin, Hua, PiGua, Cha and more. 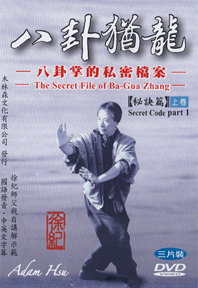 On Plum, we represent some good sources for “fundamental” information about Bagua styles, such as Fundamentals of Pa Kua Chang, Bagua: The Art of Change, Kang Ge Wu’s A Course in Bagua, Tom Bisio’s 3 DVD set. Some are more style specific some are not. In his new series, Adam Hsu has crafted a series of lessons able to heighten any practitioner’s Bagua performance. These DVDs really do “decode” some key concepts. 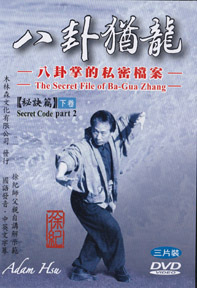 Volume One concentrates on the valuable basics of footwork, drilling, spine exercises and other crucial points unique to Bagua. Volume Two goes into numerous applications of the palms, hi-mid-low stance training, a whole discussion on Bagua’s Qigong, pole work with multiple poles, marching practice and more. It concentrates not on the general Bagua walking circle and form, but on major twisting and coiling concepts, and other examples proving Bagua to be as exceptional a style as Adam Hsu contends. Some of these (the Kuen-Zhong-Zheng-Guo Four Hands, the pole exercises, etc.) inspired me, years ago, to include them in my own teaching DVDs. THIS is how Bagua is done. This series is divided into TWO VOLUMES, each volume containing THREE DVDs (over 3 hours per volume). Posted October 7, 2016 by Plum Staff. Comments and trackbacks are open. Follow the comments feed. Do the DVD’s also include any forms and form applications? For actual form instruction, we recommend Sifu Hsu’s earlier DVDs specific to the three forms he teaches, Internal Palms, Eight Changing Palms, and Linking Palms. This new series concentrates. literally, on HOW to practice Bagua Zhang. Moves are not discussed so much as movements; in that sense, usage is taught, but not applications. In other words, there is no one-to-one correspondence of “this move is applied this way.” But Hsu Sifu is all about usage and, in that sense, how Bagua Zhang’s movements are used is covered. It is unlike most treatments of material on Bagua Zhang in that sense. This, along with many other aspects makes it, in our opinion, quite valuable. What is the purpose of low-stance training? Is it simply for strength training, or is it actually used in certain combat situations? I’ve heard that low stances are never really used in real life applications because they are too slow. But I can fathom their use in situations where the opponent has been knocked to the ground, but you have not. Are there others, or any? Also, I’ve never been satisfied with what I’ve found on low stance training for Yang Tai Chi. Would Vol. 2 of this set be helpful in understanding this; would the knowledge be transferable from Ba Gua to Tai Chi? Low Stance Training assist the student in maintaining balance, enhancing the strength of the quadriceps muscles, the Gluteus Maximus muscles, and the muscles of the lower back. Such training is also beneficial for strengthening the legs for kicks. The Zhan Zhuang (Standing on Stake) method of Shaolin Neijing Yizhichan (Shaolin Inner Energy of One Finger Zen) has much of its training done in a low Ma Bu (Horse Step) stance. Low stance training is an acceptable training method for any martial art method, and also for certain forms of demanding standing qigong sets.